There is still a huge market potential for financial inclusion in Kenya and other emerging markets. This is an opportunity presented by the low use of credit cards and other banking services. In Kenya, mobile network providers and other mobile money service providers are reaping big by bringing so many payment and banking services to these consumers. Recently there has been investments in prepay cards in the region to try fetch this unbanked group but the reach is still low. Mobile operators with their networks care quite capable to reach their consumers who are estimated to be over 30 million mobile phone users. 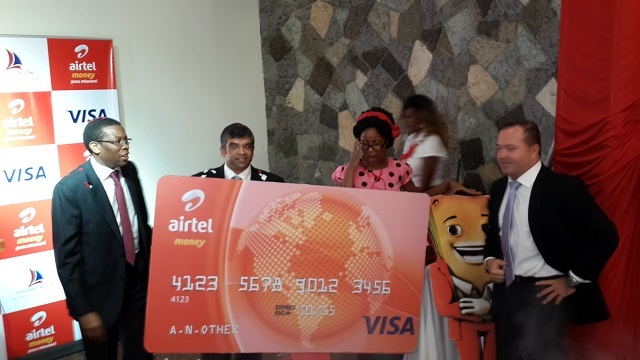 Airtel Money today unveiled a card together with Visa and running on the Chase Bank infrastructure. Existing cards available in the market like NationHela, Nakumatt Global and MiCard run on Diamond Trust Bank. Just like these others, the newly launched Airtel Money Visa Card doesn’t require you to be an account holder at Chase Bank, you register with Airtel Money as a customer, including own an Airtel SIM card. “The unbanked population in Kenya is still huge with upto 9 million independent account holders in the banks, while there are over 20 million mobile phone users in the country. This card extends VISA services and payments flexibility to these unbanked mobile users.” Says Shivan Bhargava, Airtel Kenya Managing Director. Shivan added that the product seeks to tackle limitations posed by existing services like agent banking that is time limited, and also float challenges. “With 24hr service of ATMs, one can withdraw their Airtel Money from any ATM countrywide and also make payments at any VISA merchant globally. The card is based on Chip and Pin technology that doesn’t require swiping like the magnetic stripe card. Dougie Henderson, Head of Emerging Products and Innovation at Visa Africa, says that the card was launched today as phase one that brings the mobile money on card linkage to VISA while there will be a phase two launch that will be about the e-commerce capabilities on the card.